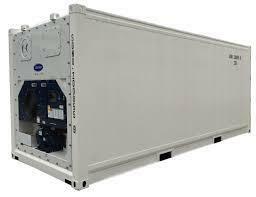 Dry/standard containers are used for all kinds of general cargo in packages such as ( pallets, bags or cartons, …etc ). They shouldn’t be used for over-weight or out of gauge cargo. Open top containers are used for bulk cargo or over height items such as machinery. The top side is basically a water proof cover instead of solid roof. This cover can be secured with ropes and cable sealing devices from all sides to secure cargo. 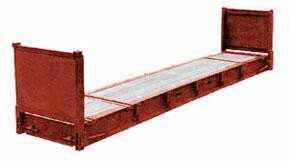 Flat rack containers are used for out of gauge or heavy cargo that needs to be loaded from the side or top. Flat rack containers with corner posts. 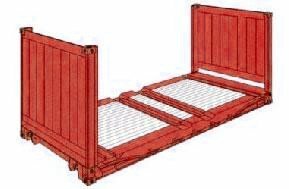 (2) Flat rack containers with 2 solid walls at each end ( collapsible – non-collapsible ). Refrigerated containers are used for temperature sensitive cargo such as ( meat, fruits and some kinds of medical supplies, …etc ). They have a refrigeration unit, with a generator, that are built within container’s body, and will pump cold air into the container. The unit will circulate the air in order to avoid cargo spoiling. 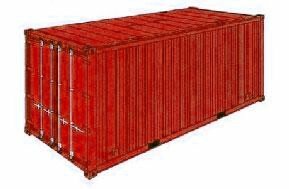 40 ft. dry/standard containers can contain more volume than 20 ft. dry/standard containers. 40 ft. open top containers can contain more volume than 20 ft. open top containers. 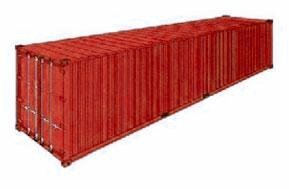 40 ft. flat rack containers can contain more volume than 20 ft. flat rack containers. 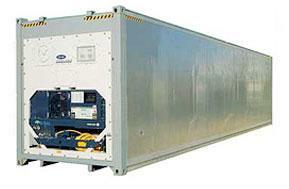 40 ft. refrigerated containers can contain more volume than 20 ft. refrigerated containers. 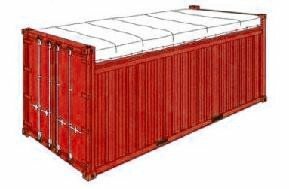 40 ft. high cube containers are used for all kinds of general cargo in packages such as ( pallets, bags or cartons, …etc ). 40 ft. high cube containers can contain more volume than 40 ft. dry/standard containers. 45 ft. high cube containers are used for all kinds of general cargo in packages such as ( pallets, bags or cartons, …etc ). 45 ft. high cube containers can contain more volume than dry and 40ft. high cube containers. *Be advised that above listed weight limits are given for road and rail transport. **Containers carrying out of gauge, or over-sized cargo are equipped with lashing devices to secure cargo. Special permits are required for out of gauge cargo. 64, El Tahrir Str. - Dokki - Giza - Egypt. Tel & fax: + 20 - 2 (37606013 - 37606014 - 37606049).